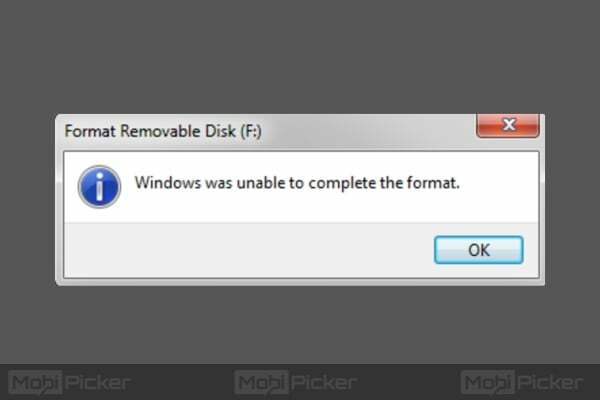 When you wish to format your USB flash drive or micro SD card and Windows shows you the message – “Windows was unable to complete the format“, it can get really annoying and frustrating. The worst is that this error doesn’t tell you why format did not complete successfully. Nor does it tell you what you have to do next to fix the issue. 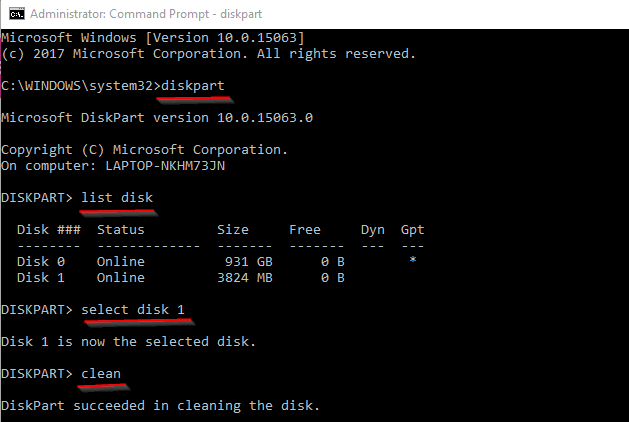 Turns out Windows failing to format the Pen drive or hard disk is quite a common issue and like every other Windows problem, this one too has a solution. Before we dive into the solutions for Windows was unable to complete the format error, it is better to understand why the problem occurs in the first place. 1 Why Windows was Unable to Complete the Format? Why Windows was Unable to Complete the Format? Whenever your USB or external hard disk is infected with a virus, chances are that the virus has actually corrupted the disk file system, preventing the OS from formatting the disk. If you don’t want to run into this problem again, make sure your USB drive and hard disk stay free from virus and other malware. 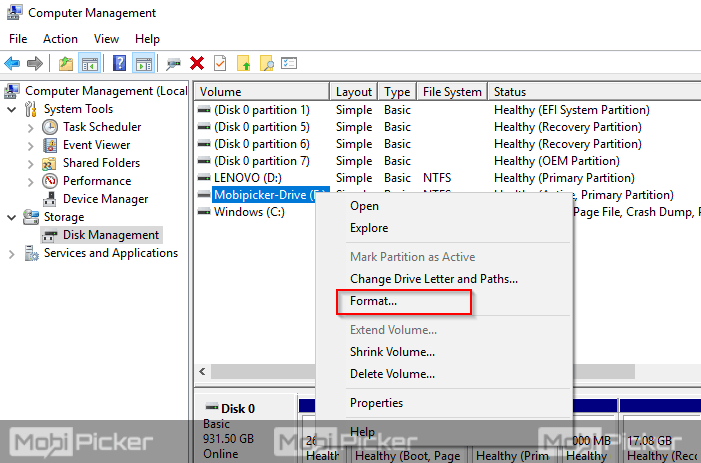 If the external hard drive / SD Card you are trying to format is ‘Write protected,’ then it explicitly prevents Windows from formatting the disk. Whenever a sector on the media storage device is damaged, it prevents Windows from formatting the storage device. Files that are stored on USB drive or hard disk usually occupy sectors that are not continuous. Bad/damaged sectors cannot be written to and Windows complains about this with the annoying message – Windows was unable to complete the format. If your USB drive or hard disk has suffered physical damage, chances are Windows will never be able to use the device. Sometimes, when you drop your hard disk down, the impact damages the circuitry inside. This can lead to improper functioning. Now that we understand the reasons why Windows fails to format your USB drive or hard disk, let’s take a look at the solutions that will help you resolve this issue once and for all! Unless your USB drive is damaged physically to a very bad extent, the solutions that are presented here should help you format your USB drive or hard disk without any issues. The first thing that you should try is formatting using Disk Management. Note: We are using Windows 10 to perform these methods. However, these methods also work on other Windows versions including Windows 7 and Windows 8. 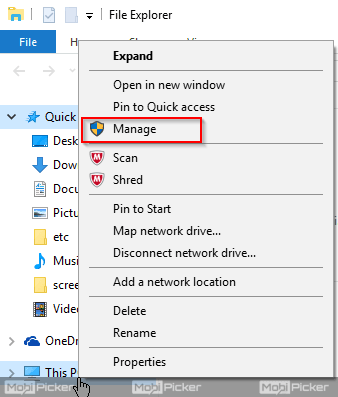 Step 1: Right click on This PC (Windows 10) or My Computer (older versions of Windows) and select ‘Manage‘. Step 3: Select the file system in next window, and click OK. When the process is complete, you will see that the drive has been successfully formatted. If this doesn’t fix the issue, try Method 2. Sometimes, command prompt can be used to solve annoying issues. But this requires a basic understanding of command prompt usage. If you are not familiar with command prompt, we advise you to proceed with caution. Step 4: In next command, we will select the drive which we need to format. It is suggested to cross check the drive before selecting it. A wrong selection could result in important data loss. This command will format the selected drive. In this command, I have selected the quick format with NTFS file system. 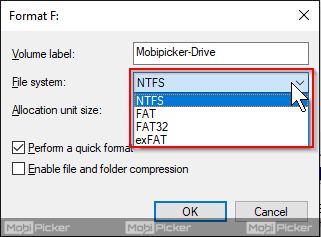 Mobipicker-Drive will be the name of drive after format. You can modify it as per your preference. Using the DiskPart, you can format the micro SD / pen drive in no time. If this method also doesn’t help with the error Windows was unable to complete the format, try out next solution. There are many tools available that will allow you to format USB drives or hard disks without you having to go through all the technical details like entering commands in command prompt and stuff. 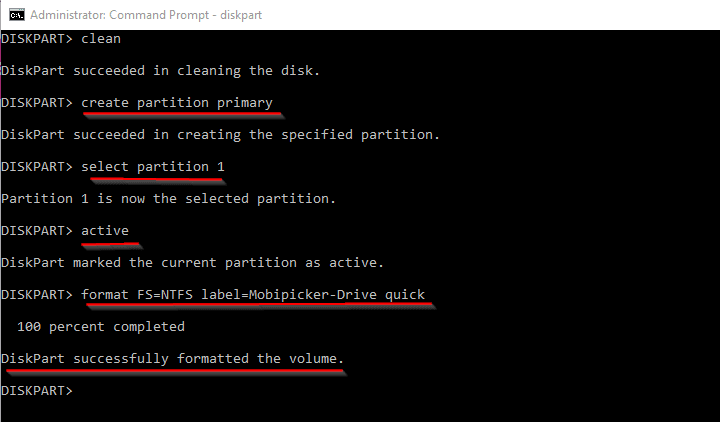 EaseUS partition tool and Eassos PartitionGuru will help you format disks easily. Tools like Easson PartitionGuru come with free trial options, which you can make use of to fix some really bad annoying formatting issues. More often than not, the first two methods will resolve the Windows was unable to complete the format problem. If not, you can always try one of the several tools available online. Most of these tools are pretty straightforward to use and by just following the on-screen instructions, you should be able to resolve formatting errors. If you still face problems to format pen drive or micro SD card or other external hard drives, comment below with complete error details and we will help you.